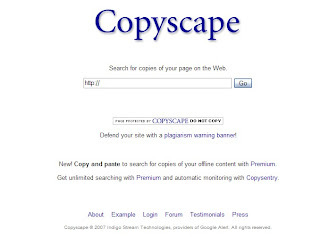 Copyscape is a nice online tool that lets you easily identify sites that have copied your content without permission, as well as those who are quoting your site. It is very simple to put your web address on the bar, click "Go". Copyscape can detect who plagiarized your content, it shows you the top results for your search, and you can also click on a result to see a word-by-word comparison with the content on your site. It also highlight text which copied from your site, and tell you how many texts that copied. I guess it uses a detecting search engine, some texts are not from your real content. But it is nice tool.